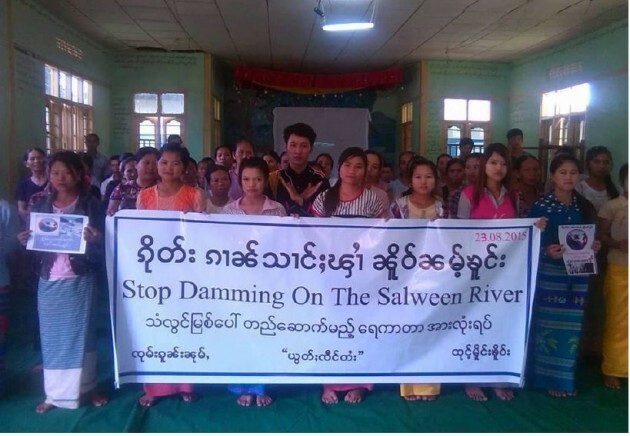 Shan community representatives presented 23,717 signatures opposing the construction of plans to dams the Salween River to the Australian company doing the environmental and social impact assessments (EIA/SIA) for the Mong Ton dam in southern Shan State. The Shan community representatives delivered their petition to the Snowy Mountains Engineering Corporation (SMEC) offices in Yangon. The Mong Ton dam is the largest of the five dams planned on the Salween River. The Mong Ton dam is a project managed between China’s Three Gorges Corporation, the Electricity Generating Authority of Thailand, and Myanmar’s Ministry of Electric Power and International Group of Entrepreneurs. It is estimated that the dam will generate 7000 MW of power, 90% of which will be exported to Thailand and China.